I try to share honestly on social media and through writing because I want to bring awareness to Lyme Disease and other chronic illnesses. Before my health took a major decline and I realized that my problems were caused by more than just a lack of sleep and imperfect eating habits, I was completely naive. I had no idea that chronic illnesses caused such debilitating symptoms. So, what don’t you see when you look at me? A lot. I truly wish I could let you live in my body for just one day to understand the continual roller coaster. I know we all have ups and downs, but this is different. You don’t see the pain of all types that migrates around my body. You don’t see my limbs falling asleep, leaving me unable to walk at times. You don’t see my hands hurting so badly that sometimes I cannot even hold a book. You don’t see the insomnia — either being unable to fall asleep in the first place or waking up in the middle of the night and being unable to get back to sleep no matter how many good sleep habits I implement. You don’t see the emotional struggle I’ve had as I’ve been forced to release attachment to my favorite foods. Finding out that Lyme has wreaked havoc on so many systems of my body has been hard to handle. After getting testing done, I learned that I’m intolerant to gluten, dairy, soy, eggs, peanuts and a few other things. I’ve had to relearn to eat and it’s been challenging. I don’t know what I’d do without bone broth protein shakes! You don’t see the headaches. You don’t see the jaw pain that hinders my eating. You don’t see the intense planning I have to do just to go about my day. From the 60+ pills I have to take to the schedule for taking them, it’s a lot of work just to live. You don’t see how my body is cold all the time (well, unless you work with me, then you see the space heater and heating pad). You don’t see the way my desires have changed as I’ve lost interest in most things I used to like. You don’t see the stuttering. It’s bad. When I get tired in the evenings it generally happens. My brain has thoughts I want to express, but they don’t come out in the right way. I get frustrated and upset. Those closest to me are gracious during those times, but it’s still painful. It still hurts. I was so excited to hold my baby niece, Elise! Being an aunt is wonderful. What you don’t see in this picture is that while I enjoyed holding her, I was only able to do so for about five minutes before my arm hurt too much and I had to give her back to my sister. One of the worst things is how fast symptoms change. Unless you are close to me, you probably aren’t around enough to notice this, but the symptoms change quickly. I can be feeling pretty good and think it’s going to be a great day, only 20 minutes later to find myself nauseated and about ready to throw up. My mood may be positive one moment and then five minutes later, I start crying for no apparent reason. I sometimes have to just let the tears flow. Probably one of the greatest examples of how looks are a bad indicator of my overall health is during times when I’m out and about at community events. I could have had a decent day, so I choose to go out to a street fest downtown because I just want to feel normal. At the street fest, I see people I know and can hold conversations with them(a big success to actually hold a conversation and enjoy it — this is not always possible with Lyme!). What usually happens later, though, is after walking for a bit, I grow tired. This isn’t just your regular tired. I know my Lyme-ridden body well enough to understand that this means things will quickly stop working. I do my best to make it back to my apartment and then struggle to climb the stairs. By this point, the stuttering begins, making speaking nearly impossible. I am out of breath. My whole body hurts and lying down is the only thing that will help. I know that my body could only handle a small piece of the event before being too tired to keep going, but those I was interacting with only saw the good side of me. They only saw the “normal” Emily. The one who can carry a conversation, who can enjoy life and have fun. They didn’t see the aftermath of trying for a small moment to be like everyone else. They don’t know that going out to the street fest was the only time I left my apartment all weekend. The rest of the time was spent either on the couch, in a detox bath, or in bed. I share my story and the side you don’t see because people with chronic illnesses are misunderstood. Others think they can’t really be that sick if they are out getting groceries or socializing. In reality, they might not have anyone to help them buy their groceries or maybe they just needed a small window of interaction with the outside world. Even if you have the same illness as someone else, you still can’t fully comprehend what is going on in their mind and body because each of us is uniquely made. Illnesses affect everyone differently. We should all remember that there’s more beneath the surface. Outer appearances only tell so much. 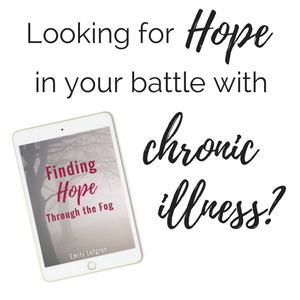 I’d love to give you your free copy of the eBook Finding Hope Through the Fog. In it, I share about my personal struggles with chronic Lyme Disease and how I have been able to find hope even in the darkest times of the disease. Then, you get some practical application questions to help you find hope no matter where you are on your journey, whether you have chronic illness or not. I hope you’ll be encouraged! Thank you so much for sharing your experiences with chronic illness. I have an autoimmune disease that I am constantly struggling with. This post was just what I needed to hear after a few nights of no sleep. I had been praying that God send me some guidance for coping with my illness. He answered my prayers through your post. God answers prayers in many ways and sometimes it’s through other people’s stories. I am glad he did. Shanoda, I’m so sorry to hear you’ve been experiencing such rough nights lately, but I’m incredibly glad to hear how God has used this post as an answer to your prayers! That’s a huge encouragement to me! Praying for you right now!! We live very similiar lives…I can certainly empathize with you. Wishing you better days ahead! Thanks so much, Pamela! I’m praying the same for you! Thank you so much for sharing this with us – I feel EXACTLY the same way about my Fibromyalgia and brain injury! Especially not being able to express myself after I get tired – I don’t stutter, but I just can’t find the right words, leaving awkward silences, and other people trying to finish my sentences for me. Glad you do get out sometimes even if it is tiring. Stay well! What you say is absolutely true! People who don’t live in this really put their own preconceived ideas onto us. I think the majority of those who have not yet been stricken with a chronic illness spend most of their lives in denial, and our culture doesn’t help matters with images that bombard the general public implying if you only eat right and exercise you can somehow magically prevent yourself from becoming ill. There is an insideous blame implied in all of the wellness propaganda that comes before us in ads and TV shows, and even research studies which always seek to blame obesity or vitamin deficiency for every illness under the sun. Even doctors don’t always understand. It would be better if people around us just asked rather than told us how we feel or what we can or can’t do. That would make things a whole lot easier. Hi Polly, I am so sorry to hear about you chronic condition. Those migraines sound unbearable. It’s hard not to look back and think about how life was before, isn’t it? Yes – people really have no idea what’s going on beneath the surface of our outer shells. Thank you for the encouragement, sweet Polly! Hi Amy! I’m sorry to hear that you also have Lyme…it’s such a rough illness, but it can be comforting to know that we aren’t alone in the struggle! The eBook is in pdf form that you can get by entering your email, but I also have a .epub version that I can send you through email if you’d like it! I believe you can read .epub on the Nook, but I don’t actually have a Nook so I’ve never tried it! Thank you for praying! I do believe that God is working through those with chronic illnesses who are connecting and sharing what He’s placed on our hearts! Lots of love to you! Hi Linda! I hope you had a great Christmas! Thank you so much! My prayer in writing is continually to encourage others who are going through similar experiences and to shed light on what those with chronic illnesses face. Lots of love to you! Love and hugs sent to you! Thank you Emily for expressing your words for those of us who fight the fight, smile along our journey, make each day the best we can, and more importantly, communicating our “unknown” daily battles. Hopefully others may gain even just a little insight about our chronic illness! Hi Sheri! Thank you so much for reading! Yes – before getting so sick myself, I had no idea what many people experienced on a daily basis. Our battles can be difficult to even put into words to express to others. Happy New Year! Lots of love to you! I think you look pretty good, but I know that’s small consolation when you have a chronic illness. The worst thing is trying to stay positive and you seem to be doing a good job. I say “seem” although I know I may be wrong. Keep smiling, nothing can take away your gorgeous smile. Thank you so much for this post. I am there with ya sister and so is my 18 year old. It is hard, real hard. I start to feel better and think I can conquer the world then boom I am back to feeling crappy again. Emotions are up then down….down ….down then up. So tired of this fight. Thanks for letting me know we are not alone! Keep fighting and keep informing people of our disease! Thank you so much for reading! I wish that none of us were going through this, but it is comforting to know that others understand! Yes – we are not alone! !